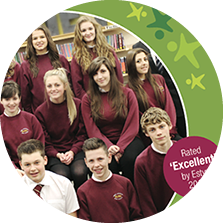 Elfed High School, is an ‘Outstanding Learning Community’ where staff and students share a passion for excellent teaching and learning. It is a school where every single student is supported and challenged to succeed. A ‘growth mindset’ has been embedded in every aspect of school life, encouraging a ‘have a go’ ethos that removes fear of failure and turns ‘FAIL’ into ‘First Attempt In Learning’. With a clear strategy and a strong focus on achieving measurable objectives, the school engages with stakeholders and pupils to deliver a comprehensive approach to education which extends beyond the school into the community and partner primary schools — the ‘supply chain’ and ‘customer base’. The school head is recognised by Welsh Government and others as an inspirational leader who shares well thought out strategies in professional and visual communications which are endorsed and promoted at every opportunity. She was awarded an OBE for services to education in 2016. The school ethos is to learn together and make the most of opportunities in lessons and extra-curricular activities. The school is considered a community which provides a high quality of care and guidance for students of all abilities. This approach is recognised through exam results, student achievements, Estyn inspection reports and educational accolades. School places are sought after and the school’s intake increased significantly (circa 30%) over the last eighteen months. 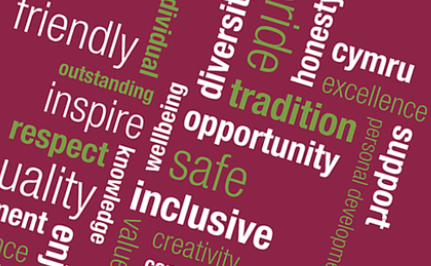 The school strives for students to be happy, safe and successful, and to provide guidance, encouragement and support to enable young people to become adults who are confident and resilient, with a desire to make the most of life and be well-placed to progress to FE, HE or employment. All students leave the school with a qualification and a progression plan. The school has used the Business Excellence Model as part of its Journey to Excellence to ensure a whole organisational approach to improvement. The fundamental principles of excellence promoted by the Model are firmly established and are at the heart of school improvement. Whilst other assessment frameworks, including the Estyn Common Inspection Framework, have used elements of the Excellence Model, only the Business Excellence Model provides the breadth and depth of assessment which challenges every aspect of the organisation’s operations. In 2015 Estyn inspectors judged the school to be ‘excellent’ in both their overall judgements and for the third consecutive year, the school has been categorised ‘green’ by the Regional School Improvement Consortia and Local Authority, the highest level of confidence that the school is performing well and has the capacity to be ‘self-improving’. Elfed High School won the Overall Wales Quality Award in 2016.